This is an early release feature that was slipped in without much fanfare. If you installed your CommCell using or after Version 11 SP5, you’ll be quietly downloading CommVault updates over HTTPS. For many of us though, our CommCells have evolved over various upgrades and downloads would be using FTP. While this has generally been ok, I’ve found it tends to be slow and sometimes problematic. Fortunately, it’s now easy to change and enjoy the speedy, secure goodness of https. 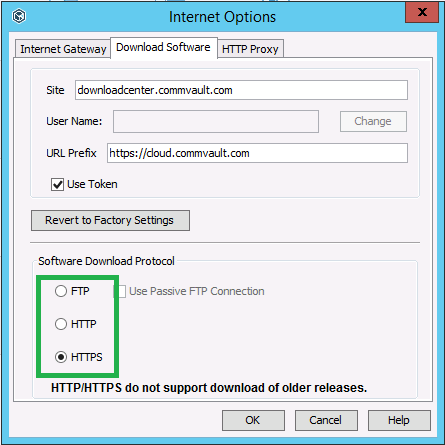 It’s as simple as going into the Internet Options and changing the Software Download Protocol from FTP to HTTPS (or HTTP). Do this at your leisure, and verify that you have the appropriate connectivity to “downloadcenter.commvault.com / https://cloud.commvault.com“. I expect FTP downloads to be deprecated soon enough.